Bimetallic nanoclusters (NCs) have attracted extensive attention in present research due to the synergic effect of the two kinds of metal atoms and their valuable applications. The broad range of applications of these noble metal NCs and their molecular nature instigated understanding their property of luminescence and the underlying ultrafast dynamics. 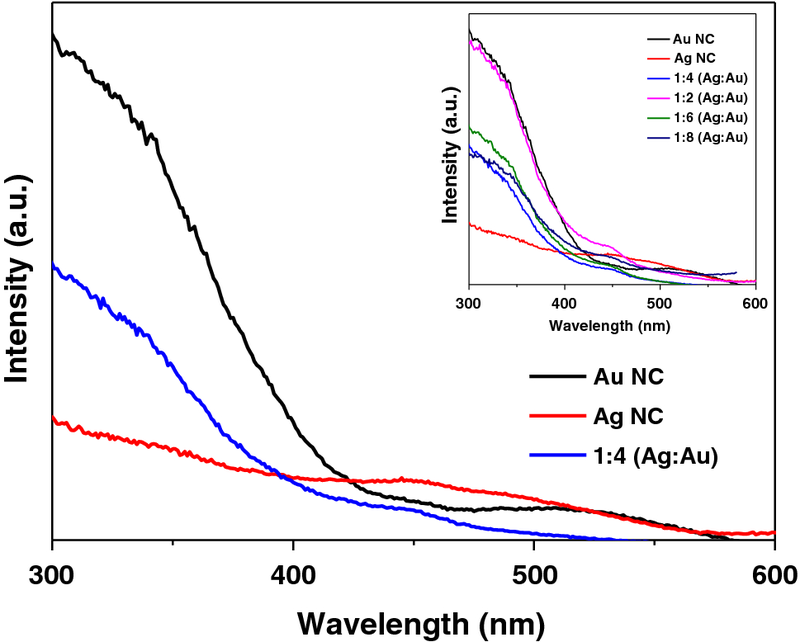 With a view to enlighten the weakly known changes in excited state dynamics of luminescent noble metal alloy NCs, protein protected bimetallic alloy gold–silver NCs (Au–Ag NCs) with different molar ratios were synthesized and characterized. The results show that a particular optimum molar ratio of the two metal atoms gives maximum luminescence to the NCs. The findings from transient absorption spectroscopy and excited state decay analysis consolidated the results and provided detailed description in this direction. Various applications, such as optical energy harvesting, bio-medical imaging and photocatalysis, would find ample flexibility on knowing the characteristics of the alloy metal NCs that might lead to relevant modulations in their properties. The present study is intended to develop the concept of ultrafast dynamics in noble metal alloy NCs. Fluorescence intensity of gold–silver alloy nanoclusters is decided by an optimum molar ratio of the metals. One can synthetically impose maximum luminescence to the alloy nanoclusters knowing the underlying dynamics. The online version of this article ( https://doi.org/10.1007/s42452-019-0473-9) contains supplementary material, which is available to authorized users. 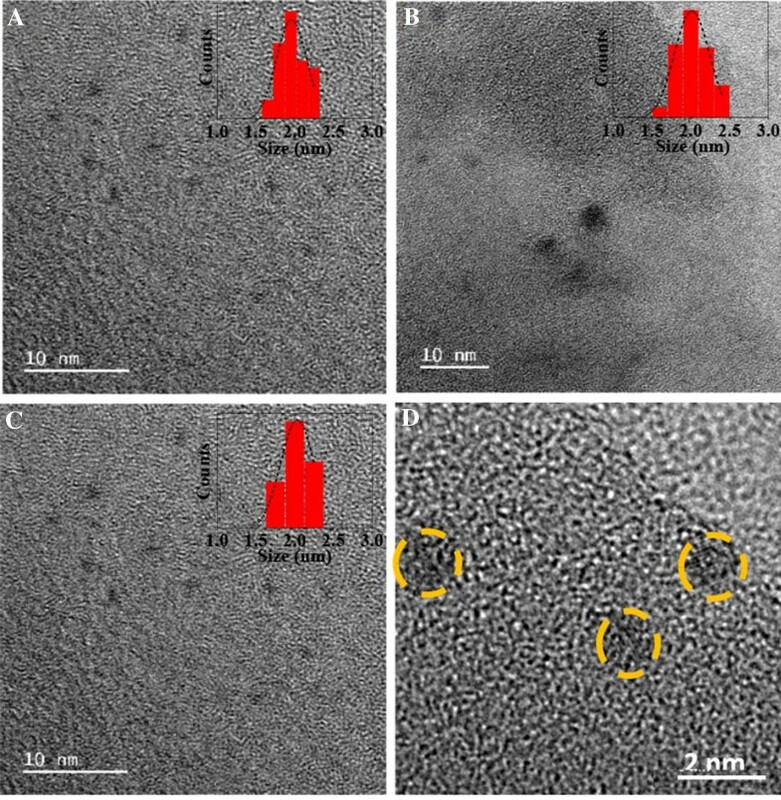 Noble metal nanoclusters (NCs) are typically constituted of a few tens of atoms [1, 2] that have extensive applications in the areas of biomarkers , optics , catalysis [5, 6] and sensors [7, 8, 9, 10]. Existence of metal as atomic aggregates and hence their quantum confinement helps the metal NCs to exhibit “molecule-like” discrete electronic properties allowing optical tuning. This, characteristically, distinguish them from their nanoparticulate forms that typically show surface plasmon effects and do not emit radiatively. The metal NCs are generally composed of a metal core and a ligand shell with atomically precise core size [11, 12]. Understandably, the optical properties of the NCs are dominated by the core-derived states of the metal atoms and the binding shell [13, 14]. Techniques to characterize small molecules, such as, elemental analysis, UV/visible and IR spectroscopies, mass spectrometry, 1H NMR, etc. can be suitably used to characterize the NCs . Considering the broad range of applications of the noble metal NCs and their molecular nature, the property of luminescence and its understanding has become essentially important. A few works described these issues from the viewpoint of ligand-to-metal charge transfer (LMCT) and/or ligand-to-metal–metal charge transfer (LMMCT) [16, 17]. To enhance the photoluminescence, various research groups worked on modulating the surface functionalization of the NCs and protected them with polymers , thiols , and proteins [20, 21] and by doping the metal core with another suitable metal [22, 23, 24, 25, 26]. In a recent report, Negishi and co-workers differentially doped the gold (Au) core of thiolate protected NCs with silver (Ag) and discovered continuous modulation of the electronic structure of the thiolate protected Au NCs accompanied by change in the photoluminescence property . 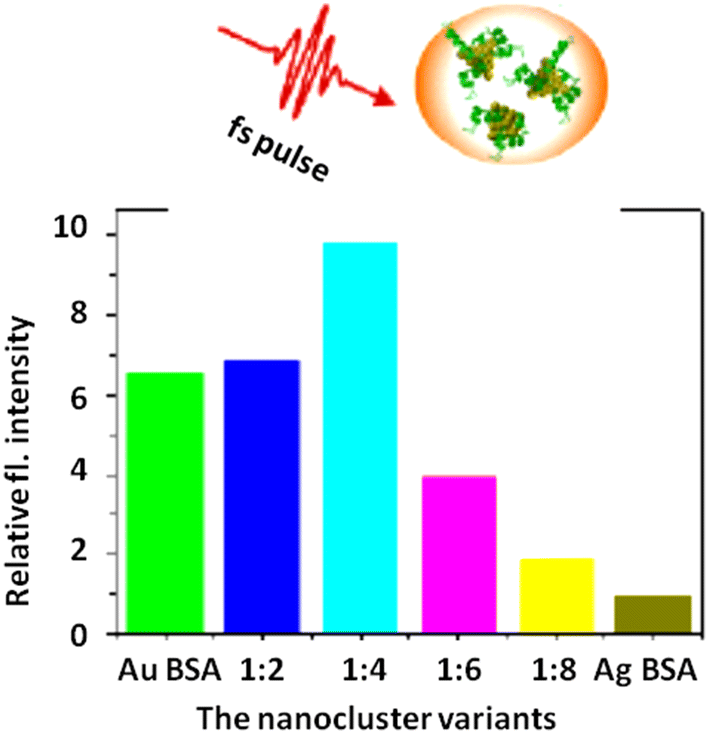 On the other hand, pristine silver nanoclusters (Ag NCs) are reported to be brighter than the Au NCs [19, 27, 28, 29]. However, they are highly reactive and release Ag ions along with oxidation of Ag in solution and rapidly lose photoluminescence . Based on the interesting properties of the doped Au and/or Ag NCs, they have been used in identifying toxic metals and applied for bioimaging and biosensing [31, 32, 33, 34, 35, 36]. In the present context, we gave special attention to the mechanistic details of emission from the thiolate protected Au–Ag NCs that happens mainly through auto-fluorescence due to intraband transition . Higher silver content produces a red shift in the optical spectral profile with an enhancement in emission intensity by 4 to 5 times on increasing the ratio of Ag in glutathione coated Au NCs (AuGSH) (excitation at 400 nm and emission at 615 nm) . AuGSH and AuAgGSH show biexponential decay of fluorescence with a shorter and a longer lifetime components, where the longer component slows down due to redox processes on enhancement of the proportion of Ag in AuGSH [38, 39]. Till latest, glutathione (GSH) and thiolates were mostly used for the synthesis of strongly fluorescent Au–Ag bimetallic clusters. Only a few reports are there where such NCs were protected with protein [40, 41, 42, 43, 44]. It is pertinent that biocompatible Au–Ag NCs can be produced only by protecting them with naturally occurring biomolecules, such as proteins, peptides and DNAs [45, 46, 47]. Protein-protected Au–Ag NCs conceptually resemble the naturally occurring metalloproteins, such as hemoglobin and superoxide dismutase . Hence, we have revisited the problem to understand the details of the origin of emission from the Au–Ag NCs by synthesizing biocompatible clusters protected by bovine serum albumin (BSA) [48, 49]. 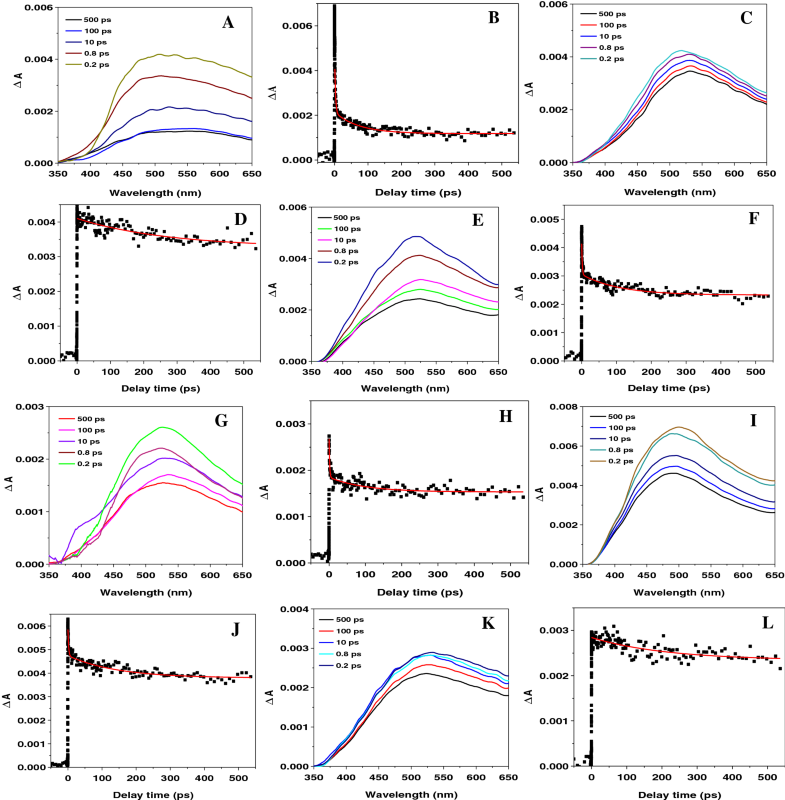 Ultrafast spectroscopy showed that the fluorescence from the Au–Ag NCs does not increase gradually with increase in Ag concentration in Au NCs, but the maximum emission comes from an optimum ratio of Ag and Au (typically 1:4). Based on the observed facts on variation in the fluorescence quantum yield of these bimetallic NCs we have shown probable application in creating molecular logic gates. The chemical precursors, HAuCl4•4H2O, AgNO3, NaBH4, NaOH, and BSA were purchased from Sigma-Aldrich and used as received without further purification. The solutions were prepared in triple distilled water. The absorption spectra were recorded in a Hitachi U-2900 spectrophotometer. The steady state fluorescence measurements were carried out using a QM 40 spectrofluorimeter from PTI Inc. The time-resolved fluorescence experiments were performed using a Horiba Jobin–Yvon Fluorocube instrument with a 377 nm diode laser excitation source (with a temporal resolution of 70 ps) using time correlated single photon counting (TCSPC) method. Electron dispersive spectroscopy (EDS) was performed using a JEM-2100F field emission gun electron microscope with EDS, diffraction pattern software, and high angle annular dark-field scanning transmission electron microscopy detector. Transmission electron microscopy (TEM) images were recorded with a JEOL, JEM-2100F microscope using a 200 kV electron source at the DST-FIST facility in IISER Kolkata. The dynamic light scattering (DLS) and the ξ-potential measurements were carried out in a Nano Particle Analyzer SZ-100 from Horiba Scientific. Thermogravimetric analysis (TGA) was done on a Mettler-Toledo TGA/SDTA 851e instrument. Approximately (5–6 mg) of the sample was added to an aluminium crucible and heated from 40 to 500 °C at a rate of 10 °C/min under continuous nitrogen purge. Powder X-ray diffraction was performed using a RIGAKU Smart Lab X-ray diffractometer using Cu Kα radiation operating at 35 kV and 70 mA. Both pristine and alloy metal NCs were synthesized using reported protocols [45, 48, 49]. Synthesis of Au NCs was carried out at physiological temperature (37 °C). Upon adding HAuCl4 to the aqueous BSA solution, the protein molecules sequestered Au ions and entrapped them. The pH of the solution was adjusted to 12 so that BSA could act as a reducing agent to produce the Au NCs in situ . To synthesize the Ag NCs, a 5.0 mL aqueous solution of AgNO3 (5.0 mM) was mixed with 5.0 mL of bovine serum albumin (BSA 96%, 60.0 mg/mL) in the dark at 0 °C under vigorous stirring. After 5 min, 20 μL of a freshly prepared aqueous solution of NaBH4 (5 mM) was introduced to quickly reduce the Ag+ ions. The solution of the mixture changed from colourless to pale brown after a few minutes. Stirring was continued to 4 h for sufficient generation of silver NCs . The procedure has been represented in Scheme 1. The bimetallic alloying Au–Ag NCs were prepared using BSA protein as the stabilizing and reducing agent using different molar ratios of HAuCl4 and AgNO3. An aliquot of HAuCl4 solution (4.0 mL, 10 mM) was added to the BSA aqueous solution (5.0 mL, 50 mg/mL). Then, AgNO3 solutions (1.0 mL) of different concentrations (~ 20.0, 10.0, 6.7 and 5.0 mM) were separately added under vigorous stirring for 10 min at 37 °C. 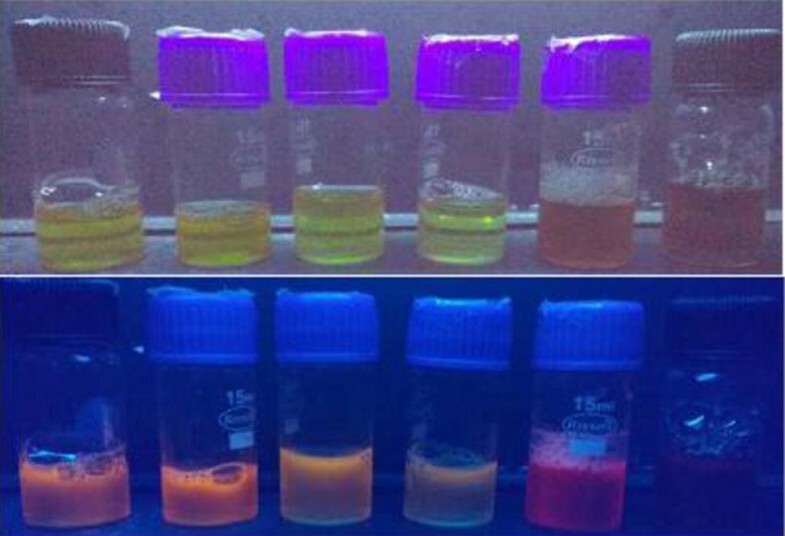 Afterward, NaOH solution (1.0 mL, 1.0 M) was introduced immediately and incubated at 37 °C for 12 h. Finally, the resulting suspension was dialyzed in ultrapure water for 48 h with the water changed every 6 h to acquire gold–silver bimetallic nanoclusters (i.e., Au–Ag NCs) and stored at 4 °C for further use [48, 49]. The molecular weight cut-off (MWCO) for dialysis experiment was 6000–8000. The experiments were performed in aqueous medium in solution phase. Concentration of the NCs was determined from the concentration of metal atom present in solution. A fixed volume of the aliquote was added each time to a constant volume of water for the experiments. The final concentration (360 μM) was calculated using (volume of aliquote)*(strength of aliquote) = (final volume)*(final strength). The samples were excited at 375 nm for the steady state spectral studies. The synthesized NCs were stored at 4 °C and there was practically no change in their characteristics for prolonged period of time. The protein coated red emitting NCs are generally very stable systems. BSA played a double role to act as a stabilizer and reducing agent for the synthesized Au–Ag NCs with different molar ratios of the respective metal precursors [48, 49]. The end products were obtained depending on the variation in the Ag+ concentration in the Au NCs in solution phase. This was identified grossly by the colour differences as depicted in Fig. 1. The pristine Au and Ag NCs were of very small size (< 2 nm) as shown in the TEM images provided in Fig. 2. The bimetallic NCs were of similar size as depicted by the high resolution TEM (HR-TEM) images given in Fig. 2d (for 1:4 Ag:Au). The crystal structure of the obtained Au–Ag bimetallic NCs was characterized through XRD, as shown in Fig. S3. The obtained signals revealed that the sharp peaks at 31.92° and 45.89° could correspond to lattice planes (111) and (200) of the Au–Ag NCs, respectively proving the presence of both the metals in the alloy NCs. The XRD results were in agreement with previous reports . DLS measurements provide that in aqueous medium the hydrodynamic diameters of the BSA protected Au and Ag NCs are ~ 5–6 nm and those for the alloy NCs are ~ 8–10 nm, respectively (Fig. S4). Impact of the formation of the metal NCs on the secondary structure of BSA was monitored using circular dichroism (CD) spectroscopy. Figure 3a shows the CD spectrum of BSA and those for the respective BSA-protected metal and alloy NCs. The CD spectrum of BSA is typically characterized by two negative bands at 208 nm and 222 nm, which are rationalized by the n → π* transition , the so-called negative Cotton effect [52, 53], in the peptide bond of α-helix. The secondary conformation of BSA changes slightly on adding the NCs. A decrease in ellipticity indicates reduction in % α-helicity in BSA [54, 55]. However, the process does not completely destroy the folded structure of the protein but makes it partly unfolded. The FT-IR spectra of the species confirm changes in protein conformation on generating the BSA-protected Au–Ag bimetallic NCs. The characteristic amide I band at 1600–1700 cm−1 (primarily CO stretch) and amide II near 1545 cm−1 regions are the signature vibrational profiles for BSA (Fig. 3b). Broadening in the peak shape indicates formation of the NCs that, in turn, induces the secondary structural changes in BSA . The ξ-potential data shows that the NCs have negative surface charge (Fig. S5). The TGA analysis provides stability of the NCs in terms temperature dependent weight loss which are almost similar (Fig. S6). Characteristic featureless absorption spectra (Fig. 4a) suggest formation of stable Au and Au–Ag NCs . In conventional noble metal nanoparticles, surface plasmon resonance dominates the optical response and shows strong quantum confinement effect with manifestations in the discrete UV–vis absorption spectrum . Such a shoulder emerges for the pristine Ag NCs at 475 nm signifying nanopaticle nature (shown by an arrow in Fig. 4a) and hence relative instability. That is why, although Ag NCs are brighter than the Au NCs, their fluorescence quenches very quickly under normal conditions (Fig. 4b). Because of this inherent artefact of the Ag NCs, this work was not compared with Au-doped Ag NCs where the proportion of Ag is higher to Au. The Au–Ag NCs show relative blue shift in their emission as the proportion of Ag decreases in the alloy NCs along with a concomitant reduction in fluorescence yield (Fig. 4b). The 1:4 Ag–Au ratio in the alloy NCs shows highest fluorescence quantum yield which is even higher compared to the pristine Au NCs. The results indicate involvement of an optimal amount of Ag doping in Au NCs that is required to generate higher emission compared to the pristine metal NCs. Since the use of noble metal NCs is progressively increasing in the area of energy harvest, hence the mixing proportions of the metal atoms are necessary to be optimized to facilitate formulation of devices. Our attempt is to specify the optical properties of the optimally mixed Ag and Au atoms in the alloy NCs. where, I (sample) and IR (reference) are the integrated emission peak areas, A (sample) and AR (reference) are the absorbances at the chosen wavelength, and n (sample) and nR (reference) are the refractive indices of the solvents. The measurement was performed taking quinine sulphate (Q = 0.54) in 0.1 M H2SO4 as standard . The calculated Q values for the various species are tabulated below (Table 1) . Ag NCs are highly prone to oxidation that results into rapid decrease of fluorescence resulting to its unpopularity as a marker. The results show that this can be hugely averted by preparing the Au–Ag NCs . The electronic states involved in the respective electron transitions and the optimal band gaps could be obtained by examining the respective excitation spectra of the metal NCs (Fig. 5). The pristine Au NCs show a shoulder at 335 and a band at 520 nm, whereas, for the alloy NCs although the shoulder at 335 nm still exists, the higher wavelength bands shifts to 445 nm. The low energy absorption band can be assigned to the S0 → S1 transition, where S0 and S1 are the singlet ground and first excited states, respectively. The band shift occurs because of destabilization of the S1 state due to the alloy formation. The shoulder at 335 nm is due to S0 → Sn transition-, where Sn indicates higher excited singlet states . Table 2 provides the respective decay parameters of the emitting species along with the average lifetime values as obtained from the decay traces (Fig. S7). Each set of the data was fitted with a three exponential decay routine. τ1 and τ2 provide the decay times for the metal atoms in 0 and + 1 oxidation states, respectively . The ultrafast decay time (τ3) for the NCs is due to the inherent electron transfer. Pristine Ag NCs have extremely short average lifetime compared to the Au NCs and other alloy NCs. This is because the lifetime components for Ag NCs are dominated by the fastest decaying species (~ 35 ps) and the fluorescence emission is lost quickly due to the synergistic effect [27, 48, 49]. On the other hand, for Au NCs and other alloy NCs, the second fastest component (~ 5 ns) could arise for the ligand (protein)-to-metal charge transfer (LMCT) transition influenced by solvent dependent emission phenomenon. The longer lifetime component (~ 150–200 ns) can be attributed to the HOMO to LUMO transition time of electron responsible for the red emission [61, 62]. The longer average lifetime value of 1:4 alloy NCs over the others signifies its better functionality. 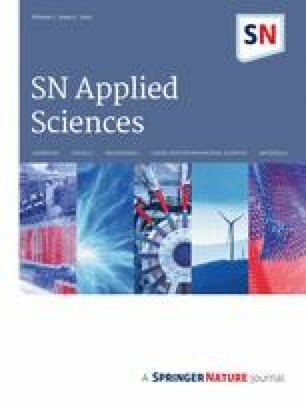 The excited state behaviour of the various BSA-coated NCs was investigated using transient absorption spectroscopy (TAS) to analyse the time-dependent change in absorbance (ΔA) after exciting the sample with a 365 nm laser pulse (150 fs), energy density of 20 mW/cm2 pulsed at 1 kHz). The samples were duly deaerated and placed in a 2 mm path length cuvette during the experiment. Figure 6 shows the excited state absorption (ESA) spectra and corresponding decay traces for the transient species absorbing at 535 nm at different delay times between 0.2 and 500 ps. The broad absorption spanning within the visible wavelengths represents the formation of the excited state species. In each of the cases, the raw data required two component fit dominated by the faster decaying species as shown in Table 3 [63, 64]. The decays at 535 nm indicate excited state HOMO to LUMO electron transfer processes occurring in the NCs. These fast processes occur quicker in the 1:4 alloys compared to the other species and hence loss in fluorescence due to the inherent excited state electron transfer is lesser. As a result the intensity of emission from the locally excited species is highest. It has been reported earlier that the enhancement in the fluorescence quantum yield of the clusters depends on the nature of the excited state . The number of Ag atoms in Au NCs affects the S1 state significantly. Molecule-like efficient internal conversion (IC) (~ 1 ps) was observed before in Au NCs accompanied by core–shell charge transfer [65, 66]. Sfeir et al. attributed the faster decaying component to rapid IC . The slower component in Table 2 was assigned to the fraction of the NCs that lives longer with delayed non-radiative processes, such as, IC or intersystem crossing (ISC) . In the present case, on irradiation at 365 nm the electron may directly get transited to the higher excited singlet states (Sn) followed by faster decay in ~ 1–2 and 100 ps (Table 3). In the 1:4 Ag–Au NCs, the longest lifetime (Table 2) indicates less quenching of emission due to IC and/or ISC compared to the other alloys. Careful analysis of the steady state fluorescence spectra reveals that while pristine Au and Ag NCs have a HOMO–LUMO band gap of ~ 1.9 eV, the alloys have it as ~ 2.0 eV. Precisely, the band gaps for the 1:2, 1:4, 1:6 and 1:8 Ag–Au alloys are 2.02, 2.02, 2.07 and 2.10 eV, respectively. Due to this variation in the band gap of the alloys, we observed blue shifts in the corresponding emission spectra compared to the pristine metal clusters. While 1:2 and 1:4 alloys have comparable band gaps, the other two are noticeably more. Difference in fluorescence quantum yield between the 1:2 and the 1:4 variants could be due to the presence of different ratios of Ag atoms in the Au NCs and hence modulating the extent of excited state electronic transitions. The obtained results from the Au–Ag alloy NCs can be utilized to construct two simple molecular logic gate operations (Fig. 7). Considering the proportion of incorporated Ag+ ions in the bimetallic NCs, YES and NOT logic gates could be built. As per previous reports, construction of various logic gates solely depends on external factors such as association and dissociation of sensing ions with or from a fluorophore and by alterations of pH and temperature of the environment [68, 69, 70, 71, 72]. On the contrary, here we have attempted to construct logic gates without influence of any such external factor. The percentage of Ag+ ions present in bimetallic NCs was taken as input. The output was defined as 1 and 0 which corresponds to strong and weak fluorescence response. NOT and YES gates could be constructed in case of 1:8 and 1:4 bimetallic alloy NCs, respectively. In case of NOT gate, the fluorescence of Au-BSA is quenched by doping with lesser amount of Ag+ ions (1:8 alloy) which indicating 0 output (low fluorescence). On the contrary, the fluorescence of Au-BSA is enhanced by doping with higher amount of Ag+ ions compared to the previous instance (1:4 alloy) indicating output is 1 (strong fluorescence). 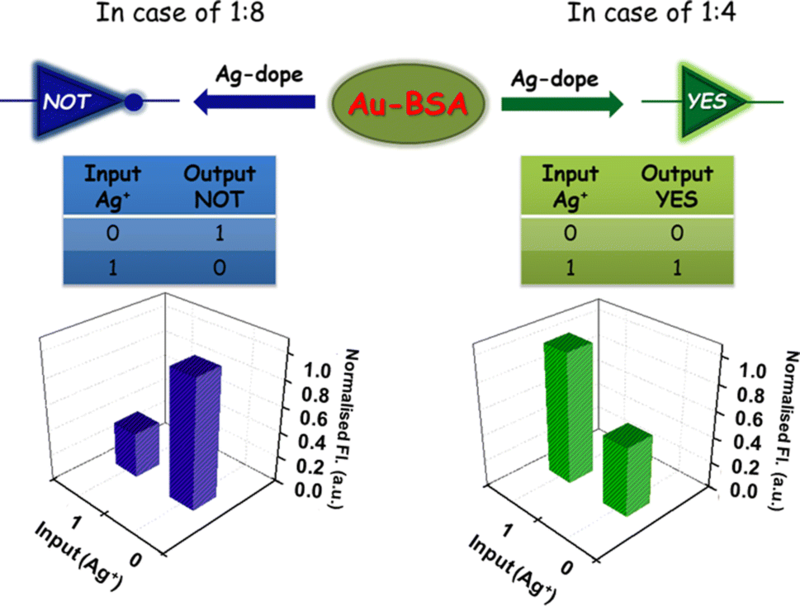 In conclusion, by revisiting the problem of excited state dynamics of BSA-protected Au–Ag NCs, we demonstrate that the NCs can emit variably and the quantum yield varies optimally considering the ratio of Ag in the Au NCs. It is found that 1:4 Ag:Au provides maximum fluorescence emission due to higher extent of electronic transition from the HOMO to LUMO. Although several reports are there on this topic using thiolate-protected Au–Ag NCs, however, hardly any conclusive description on the detailed photophysics of the alloy Au–Ag NCs are present. We could show that an optimum level of Ag-doping is needed to acquire maximum fluorescence from these alloys. The findings will help in establishing and extensively using the biologically non-toxic Au–Ag NCs as biomarkers. The work was supported by the Science and Engineering Research Board of the Department of Science and Technology, Government of India through the Project EMR/2015/000950. The authors are thankful to Dr. Suman Kalyan Pal of IIT Mandi for providing access to their transient absorption spectroscopy set-up and Dr. Dushyant Kushavah for helping in experiments. We acknowledge Dr. Somen Mondal for useful discussions. SB and SK acknowledge the Council of Scientific and Industrial Research and IISER Kolkata, respectively, for fellowships. This study was funded by Science and Engineering Research Board of the Department of Science and Technology, Government of India. (Grant Number EMR/2015/000950).